Paul pleading with Beverly to help him find his children. JIM: For pity's sake, just tell him. BEVERLY (angrily): You're trying to force me into doing something I know is *wrong*. JIM (retorts): What – you're saying what's happening to Paul is *right*? The man's life's in *ruins*. BEVERLY: All right – I'll do it. Paul gives her a hug and tells her she's not going to regret this. He asks her when she can do it, but she retorts that she'll do it in her own time. She adds coldly that if this should backfire in any way, *she's* the one who has to live with it. MADGE: Oo no – if you like *weeds*. HAROLD: Yeah, well, I've decided to *do* something about that. I'm going to buy some weed-killer and a spray gun. MADGE: Don't *buy* one; borrow one from Joe. HAROLD: No, no, no, no. I don't like borrowing tools. Though, mind you, it is all in the family now, isn't it? Yes, I just might ask him – certainly make my job easier. HAROLD: Tonight shall be sacred. It shall be for us and us alone, eh? PAUL: Oh, Dessie, Dessie, I know where they are, mate! PAUL: Gail and the triplets! They're in Tasmania, staying with her real father. She must have asked him to lie when I rang, or something. PAUL: Two boys and a girl! PAUL: Right through this whole thing, you've... well, you've just been terrific. Thanks a lot. Des pats Paul on the shoulder and says warmly that he hopes it works out. With that, Paul dashes off to catch a ‘plane. JOE: Yeah, I s'pose. I just hate feeling like a drongo in front of him, that's all. KERRY: You're *not* a drongo. Not a big one, anyway! 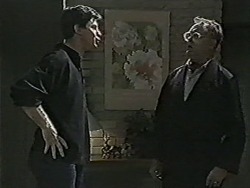 HAROLD: And how's the new Mrs. Mangel? KERRY: No, I'm still Bishop. KERRY: No – I haven't changed my name. 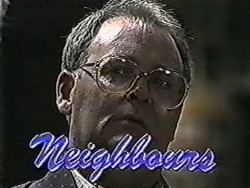 I think there's only room in this neighbourhood for *one* Mrs. Mangel – I wouldn't want anyone confusing us! HAROLD: It's your marriage, I suppose. Far be it for me to interfere. JOE: Who knows – you might win first prize! CLIVE: You told Paul where Gail is. BEVERLY (looking taken aback): How did you know? CLIVE: He ‘phoned the hospital last night, not long after you called. Gail found out, so her doctor then ‘phoned *me*. BEVERLY: How did she take it? CLIVE: Badly, from what I can gather. Her blood pressure's up anyway, so finding out that Paul knows where she is didn't help matters. JIM: Fair go, mate – Paul was in a *hell* of a state. CLIVE: No. I thought you should know that the doctor treating Gail told me he's going to lodge a complaint against you with the Medical Board. JIM: What does *that* mean? BEVERLY (snaps): It means I've broken the medical code of ethics and now I'll have to answer for it – thanks to *you*. MADGE: Whatever inspires you, Harold – just so long as you keep working. It's so long since you helped out around here, I was thinking of buying a garden gnome for company! HAROLD (knowingly): And a lucky little fella he'd be too, eh?! Harold realises suddenly that he's run out of weed-killer. Madge comments that Joe isn't going to be too happy, but Harold assures her that he's already taken care of that, and he holds up a small jar, the contents of which he tips into the reservoir of the sprayer. He then adds that he'd better get it back to Joe, as he wants to use it this afternoon. BEVERLY: Maybe. I just felt so *pressured* – and every time I looked at Paul I felt guilty, as if what had happened to him was my fault. CLIVE: That depends. If Gail suffers any ill effects as a direct result of her breach of trust, then she could be in trouble. JIM: Gail's all right, isn't she? CLIVE: For the moment she is, yeah. 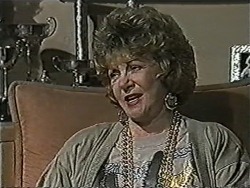 BEVERLY (snaps): Yes, but when Paul turns up at the hospital, who knows *how* that's going to affect her. BEVERLY (mutters_: I don't know how I allowed myself to be talked into this. CLIVE: Look, I know things look a bit grim right now, but Gail will probably be OK and you'll just get a *warning* from the Medical Board. They're not going to get too heavy with a first offender. JIM: Er, Beverly was accused of malpractice once before by a relative of a patient. She was cleared. BEVERLY (sarcastically): My record's going to look *great*, isn't it? What sort of a doctor *am* I? CLIVE: A fine one – you *know* that. BEVERLY: Do I? *You* wouldn't've told Paul, would you? CLIVE: I don't know. I'd like to think I'd always maintain a patient's trust, but who's to say something mightn't happen to put *me* in an impossible position? BEVERLY (demands): And just what might that position *be*? You obviously don't think you would've told given *my* circumstances. 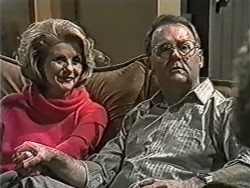 CLIVE: I don't *know*, Beverly – we all react differently. Look, with any luck, this whole thing will blow over fairly quickly. BEVERLY: It's all very well for *you* - you got what *you* wanted; but in the process you put me in a position that will cause me strife with the Medical Board, so don't you expect me to smile and say everything's fine. DES: First thing – cut up all your credit cards. KERRY: Oo... Joe won't like *that*. He's very attached to those little things! DES: It's gotta be done. KERRY: All right. Then what? DES: Well, I'll work out a repayment plan, which you'll have to stick to. Other than that, you'll just have to tighten your belt for a while. KERRY: So it's not a complete disaster? DES: No, no, of course not – you'll just have to watch your pennies, that's all. DES: Yeah, I really miss her. It just seems like forever! JIM: My day gets better all the time. GLORIA: I've just been to see the police. I told them who sold those parts to Rob. A look of relief crosses Jim's face. Gloria goes on that she's sorry she put him through a hard time, but it was really hard dobbing-in a mate of Rob's. Jim assures her that she's done the right thing. He asks if the police said anything about dropping his charges. Gloria smiles that now that they've got the supplier, they'll leave *him* alone. Jim beams at Gloria that she's made his day. GLORIA: Who'd blame ya?! Who'd wanna follow in the old girl's footsteps, eh? How *is* the old girl, eh? JOE (looking put-out at Gloria's comment about his mother! ): She's still recovering. She's just had a *major* heart operation. GLORIA: Not if it's going to end up looking like *that*, mate. JOE: Oh, Jim's going to hang me up by the... tonsils! BEVERLY: If you had any concern for either of us, you would've let us alone, then Gail could've contacted Paul in her own time and *I* wouldn't have been forced into this mess. JIM: We didn't force you to do *anything*. BEVERLY: Emotionally blackmailed, then. Call it what you like. JIM: I'd call it ‘being loyal to the family'. I mean, you and Clive keep raving on about what's ethically right and ethically wrong; well, as far as I'm concerned, what you did *was* the right thing. BEVERLY: Yes – for *you*; but I'm a doctor, for God's sake – I can't *afford* to keep getting warnings from the Medical Board. JIM: It's only happened once. BEVERLY: And now it's happening again – and this time I *am* guilty. If anything happens to Gail, they would be quite justified in striking me off the register. JIM: Then for your own sake, you've got to stop over-reacting. BEVERLY (coolly): I am not *inventing* any of this. These are all possibilities that I am facing right now – and you have made it very clear that I will be dealing with them alone. BEVERLY: It means that when it comes to family loyalties, it's quite clear where your priorities lie – and they are certainly not with *me*. With that, Beverly storms off. GLORIA: Going out, are you? MADGE: No, we're just having a nice, quiet dinner at home. GLORIA: That sounds lovely. *I* never do much cooking now – not unless one of the boys drops in. HAROLD: And you're seeing Dean tonight, are you? MADGE: Gloria, we really *would* like to ask you stay for dinner, but, um, ever since Henry and Bronwyn went away, we've been trying to have a nice romantic evening together, and this might be our last chance. GLORIA: Say no more. Keep the home fires burning – eh, Harold?! With that, Gloria takes her leave, telling Harold and Madge as she does so to have fun! JOE: I haven't got a clue – but they're cancelling work left, right and centre. I mean, first Jim's azaleas cark it; now they're *all* dying on me. KERRY: Well you must have done *something*. JOE: Yeah, but *what*? I mean, I haven't done it on purpose. It's not as though we can afford it right now. KERRY: What did you spray with? JOE: Oh, you know, that old spray I've had for yonks. The one I loaned Harry... today. KERRY (warily): Are you thinking what *I'm* thinking? HAROLD: No, no, no, I mean this is our night of romance and I intend to be romantic! MADGE: Well, you romance away – you won't find me resisting! JOE: Just *what* did you put in that spray gun I loaned you? HAROLD (blankly): I beg your pardon. HAROLD: All right, all right, all right, I heard you. No need to shout. JOE (tersely): Mate, my career is falling down around my ears and I think it's your fault. *What* did you put in that spray? HAROLD: Well, weed killer – and I replaced more than I used. JOE: That was insecticide in there, mate, *insecticide*. Harold stands there open-mouthed and asks if that means he sprayed his weeds with insecticide. JOE (angrily): Give the man a banana! JOE: Agent Orange, mate. I've zapped the whole neighbourhood. JOE: Thanks to *you*, ‘dad', I've just exterminated my whole business. Harold stands there looking worried.